"EVERYONE CAN PLAY: Featuring an all-surface base, the All Surface Swingball Jr. is designed after the Classic but suitable for even younger kids & exciting competitive matches for the whole family. OUTDOOR ACTIVITY: Encourage active play and develop hand-eye coordination skills with this family-favorite outdoor game. Tetherball-style game suitable for single or double play. PLAY ON ANY SURFACE: The durable, weather-resistant components are easily setup. The base offers amazing stability and can be weighted with sand or water for a sturdy anchor on any ground surface. PORTABLE: Easy to store and carry. All the parts conveniently fit into the locking carry base. From your backyard to the beach, you can have Swingball match anywhere! SPECIFICATIONS: INCLUDES: (1) all-surface base, (2) Checker bats, and (1) tennis ball and tether attached to the spiral head of a pole. Recommended for ages 4 and up. Number of players: 1 or 2 players. EVERYONE CAN PLAY: Featuring an all-surface base, the All Surface Swingball Jr. is designed after the Classic but suitable for even younger kids! Exciting competitive matches for the whole family. SPECIFICATIONS: INCLUDES: (1) all-surface base, (2) Checkerbats, and (1) tennis ball and tether attached to the spiral head of a pole. Recommended for ages 4 and up. Number of players: 1 or 2 players. 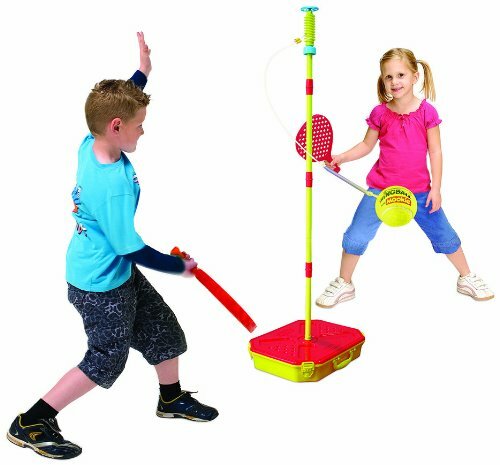 If you have any questions about this product by Mookie Swingball, contact us by completing and submitting the form below. If you are looking for a specif part number, please include it with your message.